It’s been 35 years since Rod Piazza laid down his first studio tracks as a member of the Dirty Blues Band. 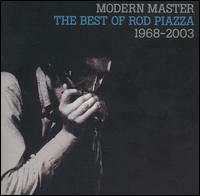 His recently released, two-CD career retrospective (Modern Master: The Best of Rod Piazza) demonstrates that despite the passage of time — and his waltz through several ensembles including Bacon Fat, Chicago Flying Saucer Band, and now his own Mighty Flyers — his music hasn’t changed all that much. As evidenced by his early recordings of Willie Dixon’s Spoonful and Walter Jacobs’ Up the Line, Piazza always has been a gifted harmonica player, capable of whipping up a flurry of notes with stirring intensity. And later material — be it a cover of Little Walter’s Blue Midnight, his wife’s Murder in the First Degree, or his own Tough and Tender — serves to document how Piazza developed into a fine vocalist and band leader. Still, there isn’t much on Modern Master that distinguishes Piazza from better known artists such as John Mayall, Paul Butterfield, or Charlie Musselwhite. Of course, that’s good company to keep, and for those looking for additional solid sets of modern electric blues, this collection, which features several previously unreleased tracks, is as perfect a package as one is likely to find in Piazza’s extensive discography.